A growing body of literature has explored the impact of ethnic fractionalisation on long-term development outcomes. This chapter explores the way ethnic identities relate to the dynamics of exclusion by focusing on attitudes towards a multi-ethnic state and ethnically mixed living in post-independence Kosovo. This study is based on a survey (face-to-face interviews) of 1,367 respondents carried out in Kosovo 4 months after it proclaimed independence. 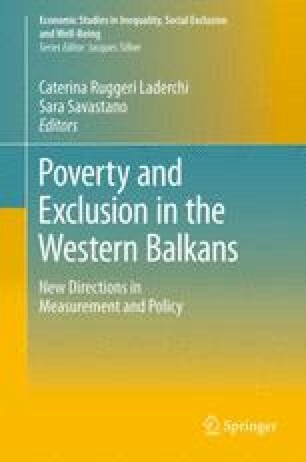 Responses of the ethnic Albanians, the ethnic Serbs and other minorities in the country are contrasted, but important differences are identified across groups defined by age, gender, income levels, area of residence and labour market status. These findings suggest that, despite the prevalence of negative attitudes towards a multi-ethnic state and residential co-location which emerge for some groups, a number of factors potentially influenced by policy mediate the way ethnicity translates into attitudes towards integration. Balkaninsight (2008) Kosovo slams Serb leader’s partition claim. http://www.balkaninsight.com/en/article/kosovo-slams-serb-leader-s-partition-claim. Accessed 15 November 2011. Bancroft I (2009) The flight of Kosovo’s Minorities. The Guardian. http://www.guardian.co.uk/commentisfree/2009/jun/03/kosovo-minorities-eu-government. Accessed 15 November 2011. Collaku P (2011) Kosovo Census to Start Without the North. Balkan Insight. http://www.balkaninsight.com/en/article/kosovo-census-starts-without-northern-kosovo. Accessed 15 November 2011. Djukanovic D (2008) The Post-conflict Integration of Minority Ethnic Communities in Kosovo. Paper presented at the Third Annual Conference on Human Security, Terrorism and Organized Crime in the Western Balkan Region, organized by the HUMSEC project in Belgrade, 2-4 October 2008. http://www.humsec.eu/cms/fileadmin/user_upload/humsec/Workin_Paper_Series/WP_Djukanovic.pdf. Accessed 15 November 2011. Flottau R (2008) Fury and Tension Grip Europe’s Newest Country. Spiegel Online International. http://www.spiegel.de/international/europe/0,1518,543247,00.html. Accessed 15 November 2011. Martin J (2009) Minority Rights in Kosovo under International Rule. EU Times Online. http://www.eutimes.net/2009/05/minority-rights-in-kosovo-under-international-rule/ Accessed 15 November 2011. Mayr W (2008) The Slow Birth of a Nation. Spiegel Online International. http://www.spiegel.de/international/world/0,1518,549441,00.html. Accessed 15 November 2011. Rapaj J (2010) The “new born” state of Kosovo. http://www.eurasiacritic.co.uk/articles/ percentE2 percent80 percent9Cnew-born percentE2 percent80 percent9D-state-kosovo. Accessed 15 November 2011. Telegraph (2008) Serbian settlers plan partition of Kosovo. http://www.telegraph.co.uk/news/worldnews/1579640/Serbian-settlers-plan-partition-of-Kosovo.html. Accessed 15 November 2011. Zejneli A and Cvekic L (2009) Kosovo Serbs Defiantly ‘Anti-Independence’. Balkan Insight. http://www.balkaninsight.com/en/article/kosovo-serbs-defiantly-anti-independence. Accessed 15 November 2011.